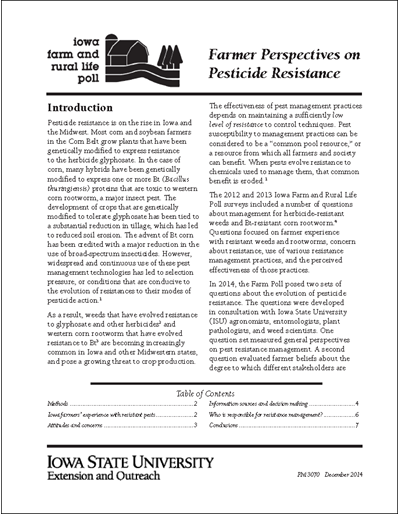 Survey results for the 2017 Iowa Farm and Rural Life Poll discuss weed and herbicide resistance management, soil health, use of small grains in extended rotations, the influence of agricultural stakeholders on farmers' decisions and decision making among multiple farm operators. Survey results for the 2016 Iowa Farm and Rural Life Poll discuss conservation practice use, changes in farming practices and strategies and monarch butterfly conservation. Information sources farmers trust is also examined. Survey results for the 2015 Iowa Farm and Rural Life Poll concern soil health, changes in farm practices and strategies, conservation practice use and monarch butterfly conservation. Questions focused on soil conservation efforts and their perceptions of those practices. 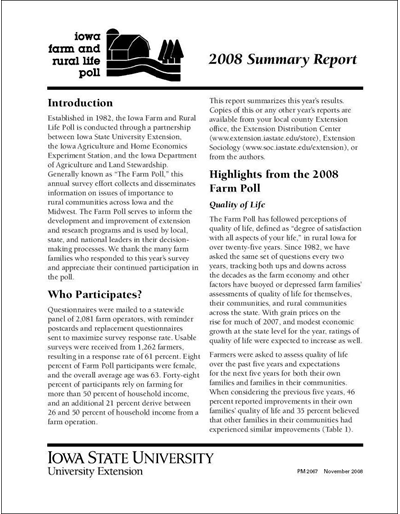 This report summarizes the results of the 2014 Iowa Farm and Rural Life Poll - an annual survey of farmers on issues important to rural Iowa since 1982. Topics highlighted: the next generation of farmers, farm family succession plans, opinions about retirement decisions, use of professional advisers for agricultural decision making (i.e., fertilizer program development, pest and crop disease management, soil and water conservation), the use of information technology, and rural quality of life. 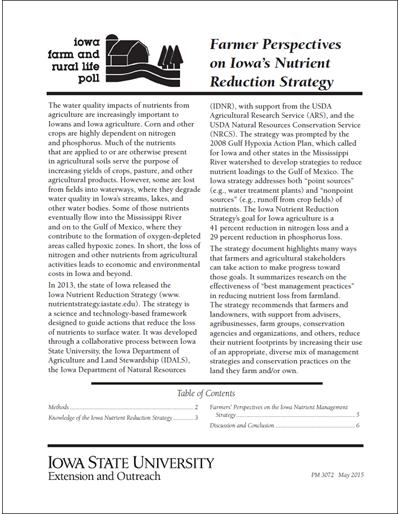 This report presents survey results from the 2014 Iowa Farm and Rural Life Poll focused on farmer perspectives on the Iowa Nutrient Reduction Strategy, a science and technology-based approach used to assess and reduce nutrients delivered to Iowa waterways, the Mississippi River and the Gulf of Mexico. The intended purpose is to help stakeholders in the agricultural community and beyond understand where farmers stand on the nutrient reduction strategy to inform outreach actions. 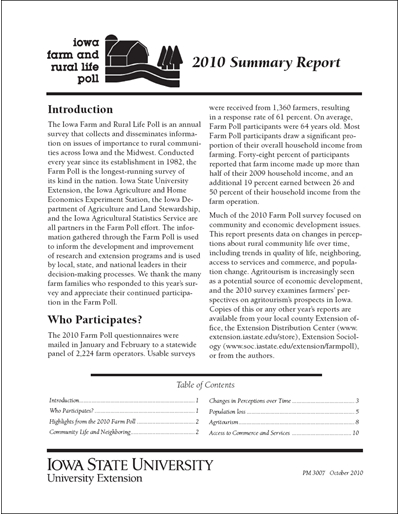 This report summarizes the results of the 2013 Iowa Farm and Rural Life Poll - an annual survey on issues important to rural Iowa since 1982. Topics highlighted: climate change, rented land, herbicide-resistant weeds, Bt-resistant corn rootworm, soil health and compaction. The 2012 Summary Report of the Iowa Farm and Rural Life Poll includes data gathered from Iowa farm families related to rural communities. Topics covered include land values, quality of life, agricultural information, uses of communication technology, concern about resistance in pests, and certified conservation farmers. Learn how research on cover crops as a means toward maintaining and increasing soil productivity, also reduce agriculture's environmental impacts. Based on data from the Iowa Farm and Rural Life Poll 2010 Summary Report. 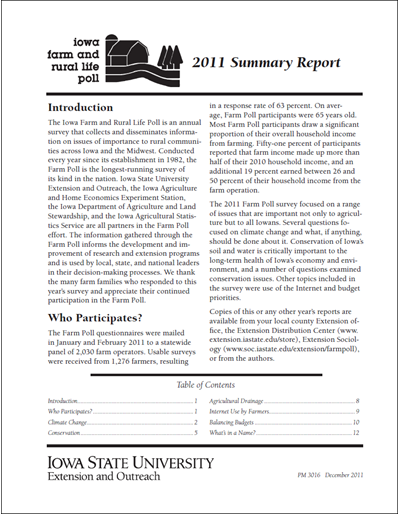 This report summarizes the results of the 2011 Iowa Farm and Rural Life Poll - an annual survey on issues important to rural Iowa since 1982. Topics highlighted: climate change, conservation, agricultural drainage, internet use, balancing budgets and what is in a name. Highlights from the 2010 farm and rural life poll inlude: community life and neighboring, changes in perceptions over time, population loss and agritourism. 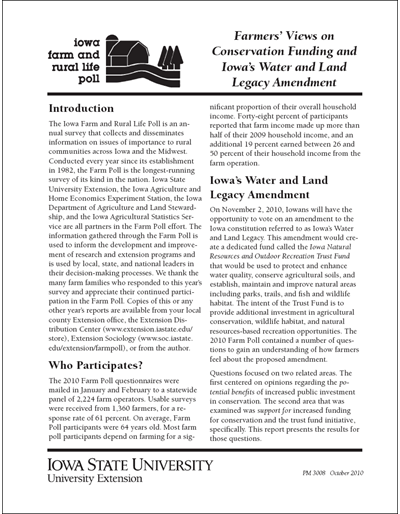 As a supplement to the annual farm and rural life poll, this survey looks specifically at a proposed amendment to the Iowa Constitution which would create a dedicated fund called the Iowa Natural Resources and Outdoor Recreation Trust Fund. Highlights from the 2008 farm poll include discussion of quality of life, financial well-being, and community satisfaction and vitality. Population changes in rural communities also is presented. This report on grain transportation and storage in Iowa is one of three supplemental publications that expand on the data collected in the 2007 Iowa Farm and Rural Life Poll. 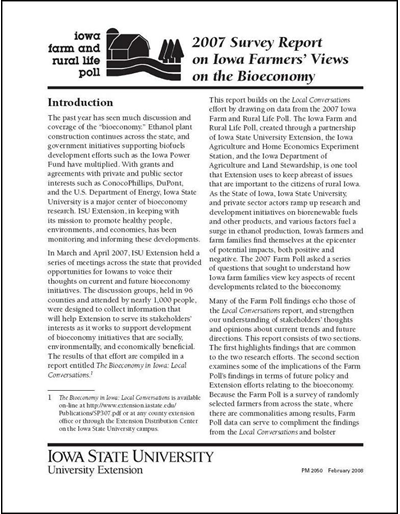 This report on the views of Iowa farmers on the bioeconomy is one of three supplemental publications that expand on the data collected in the 2007 Iowa Farm and Rural Life Poll. 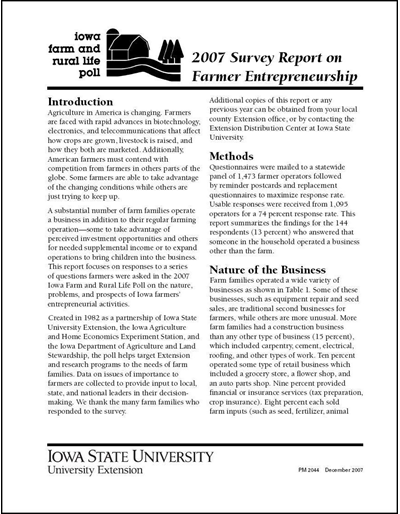 This report on the nature of farm businesses in Iowa is one of three supplemental publications that expand on the data collected in the 2007 Iowa Farm and Rural Life Poll. Data collected in the 2007 survey of 1,000 Iowa farmers provide insight into their opinions on where the bioeconomy is headed. Supplemental reports available on this web site provide additional detail. Report on Iowa farmers' opinions on energy costs, quality of life, relations with neighbors, environmental quality related to livestock operations, Internet access and use, and more. 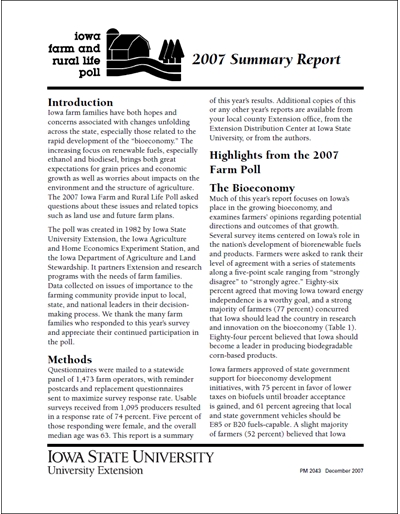 The 2005 Iowa Farm and Rural Life Poll asked questions including future governmental support through the Farm Bill, the price of farmland, incentives for conservation, farm succession, state-level economic development programs, methamphetamine production and addiction, and the ability of ISU Extension to meet farmers’ needs. Results of the 2004 farm and rural life poll regarding health insurance, future of farming, tax policy, water quality, and philanthropy. Results of the 2004 farm and rural life poll regarding quality of life. Find out what more than 2,000 rural, non-farm Iowans think about the social and economic climate in the state. Highlights include opinions on community well-being, quality of life, and sense of community. Questions were also asked about biotechnology, food safety, GMOs, and more. Survey results from almost 2,000 farmers in 2002 regarding crop and livestock issues and quality of life in Iowa. Highlights regarding community and economic development, among other survey questions, as reported in this 2001 summary. Survey results from nearly 5,000 farmers in 2000 highlighted the following topics: biotechnology, food safety and health, transgenic hybrids, average distance traveled to obtain services (business, community, etc. ), recreational and leisure activities, minority and immigrant issues, alternative livestock production, financial conditions, and quality of life. Results of the 1997 Iowa Farm and Rural Life Poll regarding risk, health issues, perceptions of well-being, job and work satisfaction, perceived financial situation, new technologies, and off-farm employment. 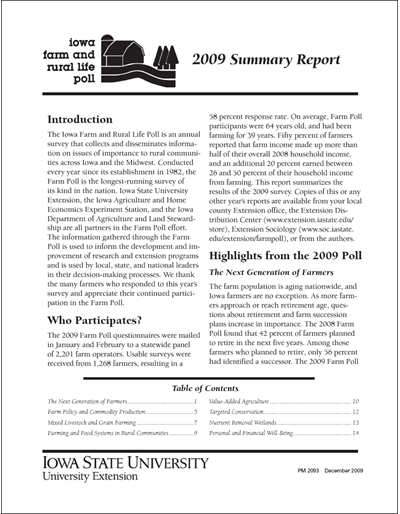 Results of the 1996 Iowa Farm and Rural Life Poll regarding future of farming, farming satisfaction, community life and neighboring, quality of life, perceptions of financial conditions, evaluation of Extension, and threats to groundwater. Survey results on commodity programs, pesticide use, quality of the farming life, community development, and more. 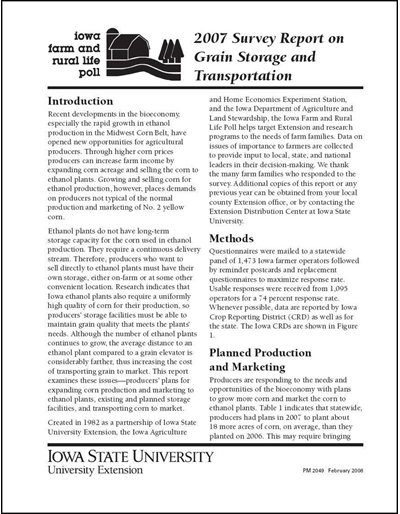 Learn what the annual survey of Iowa producers has to say in 1993 about issues impacting agriculture. 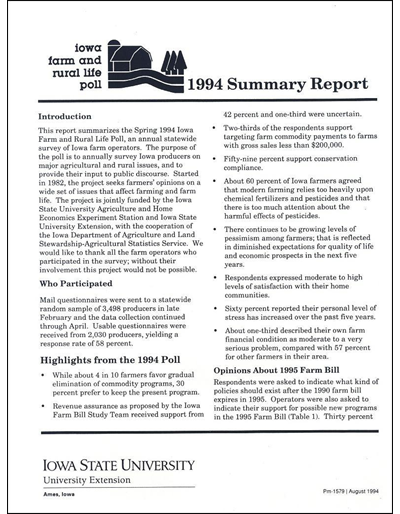 Survey results for the 1992 Iowa Farm and Rural Life Poll concern expansion of the livestock industry, state land ownership laws, farmers’ perceptions on quality of life, and farm financial conditions.